Our product range includes a wide range of hot water boiler. 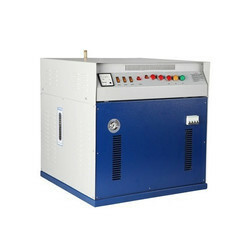 STC range of fully-automatic, self-contained generators, utilizing minimum power and space, are extremely safe and supply the right quantity of steam at the right places. They are available in a wide array of models and hence can be used for specific applications. Being portable makes these steam generators easy to handle. They can be conveniently used anywhere. These machines are compact, reliable and easy to use. Seven safety mechanisms with an alarm system makes this range of steam generators totally safe. These generators are equipped with portable softening units, feed-water tanks and high pressure water pump. Detachable stainless steel heater elements are protected by thermostats and level controller. Available in various capacities and options.